Want to feel smarter than Edison? 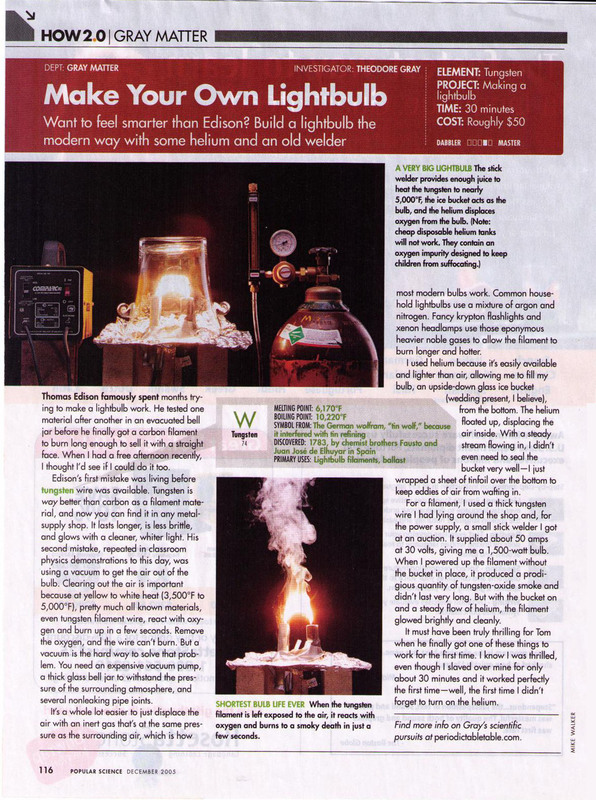 Build a lightbulb the modern way with some helium and an old welder. I used helium because it's easily available and lighter than air, allowing me to fill my bulb, an upside-down glass ice bucket (wedding present, I believe), from the bottom. The helium floated up, displacing the air inside. With a steady stream flowing in, I didn't even need to seal the bucket very well-I just wrapped a sheet of tinfoil over the bottom to keep eddies of air from wafting in. It must have been truly thrilling for Tom when he finally got one of these things to work for the first time. I know I was thrilled, even though I slaved over mine for only about 30 minutes and it worked perfectly the first time-well, the first time I didn't forget to turn on the helium. The stick welder provides enough juice to heat the tungsten to nearly 5,000°F, the ice bucket acts as the bulb, and the helium displaces oxygen from the bulb. 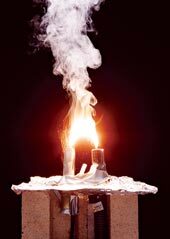 When the tungsten filament is left exposed to the air, it reacts with oxygen and burns to a smoky death in just a few seconds.